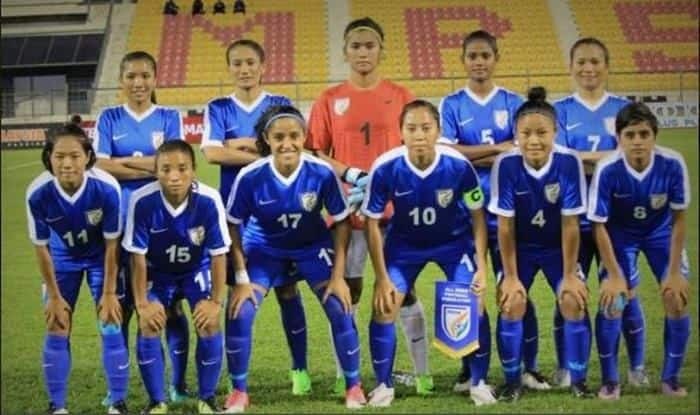 The Indian women’s football team Tuesday missed out an opportunity to qualify for the third round of the 2020 Olympic qualifiers after it was held to a 3-3 draw by Myanmar here. The Maymol Rocky-coached side, with an average age of 21, needed a win to top Group A of the Olympic qualifiers Round 2 but squandered the lead twice to play out a draw and bow out of the competition at the Mandalar Thiri Stadium here. India and Myanmar got seven points each from three matches but the home team advanced to the third round on the basis of superior goal difference (plus 8 as compared to plus 4 of India). Only one team qualifies for third round from each group. Sandhiya Ranganathan gave India an early lead in the 10th minute but Myanmar’s hat-trick woman Win Tun found the equaliser in the 17th minute. Tun scored again in the 21st minute but Sanju cancelled it out in the 32nd minute. Ratanbala Devi gave India the lead with a 64th minute strike but Tun levelled it yet again in the 72nd minute to complete her hat-trick. The Indian women, ranked 62nd in the world, displayed their attacking intent early on against Myanmar, ranked 42nd in the FIFA ladder. Sanju came close to handing India the lead as early as in the second minute when her shot from close range, off a Dangmei Grace cross, went out for a corner. The Indian women had to wait eight minutes more before surging into the lead. In the 10th minute, Ratanbala burst out on the right flank and released a low cross for Sandhiya, who made no mistake to finish from inside the box. The lead, however, was short-lived as Myanmar scored two goals in five minutes. First, Tun headed home in the 17th minute and four minutes later, scored following a spot Kick. Indian goalkeeper Linthoi Devi dived to her right to save the penalty but Tun, lurching around, scored off the rebound to make it 2-1 for the home side. India’s hard work down the flanks and in the midfield bore fruit in the 32nd minute. Myanmar goalkeeper May Nwe fluffed her lines and made a howler of a clearance that fell to Ratanbala, who chested it down for Sanju and she made no mistake in burying the chance into the back of the net. Both teams headed to the interval at 2-2. In the second half, Myanmar dominated the opening minutes, forcing the Indian defence to shut the opponents with some astute defending. Sweety Devi’s perfectly timed tackle on Tun showcased the maturity displayed by the young team. In the 64th minute, Ratanbala gave India 3-2 lead. The midfielder cut into the box from the right flank and sent a curling shot which crashed into the back of the Myanmar net leaving the opponent custodian dumbfounded. But eight minutes later, Tun completed her hat-trick, finishing from close range to equalise for Myanmar. India could have sealed the match in their favour in the 76th minute when Sanju ran clear of the defensive line, but the Myanmar custodian made a world-class save from close range to tip the Indian’s shot over the bar. A minute later, Dangmei Grace burst through but this time the custodian put her body on the line to shield the ball.